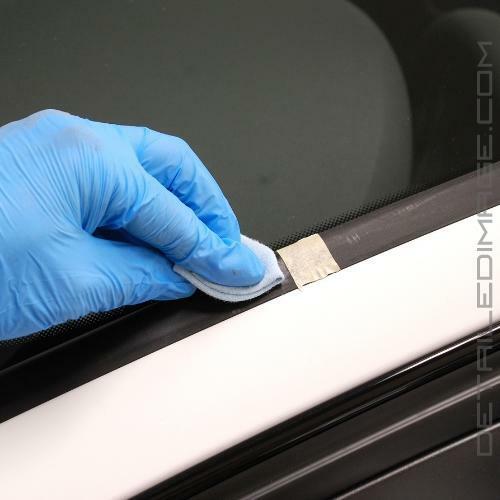 Simply spray or wipe the 303 Aerospace Protectant on any vinyl, rubber, plastic and leather surface and you'll instantly have a richer looking finish with valuable UV protection. The superior protection this product provides is critical to the long term care of your vehicle. 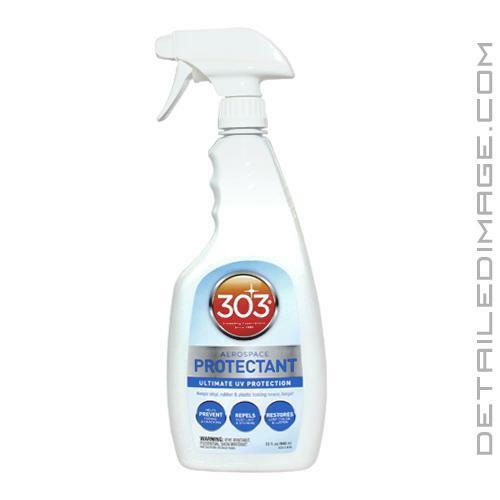 The 303 Protectant is great to use on your vehicle's rubber (tires, seals, hoses), vinyl (dashboard, doors, armrests, interior and exterior trim, engine casings, convertible tops), plastic (car bras, gauges, grills, trim, convertible's soft windows), leather (seats, trim) and so much more. This versatile product gives all of these surfaces valuable conditioners and protection that will keep each surface looking new and fresh for years to come with regular treatments. The tires, leather seats, exterior trim and dashboard often get prolonged exposure to harmful UV rays so it's important to thoroughly protect those surfaces. 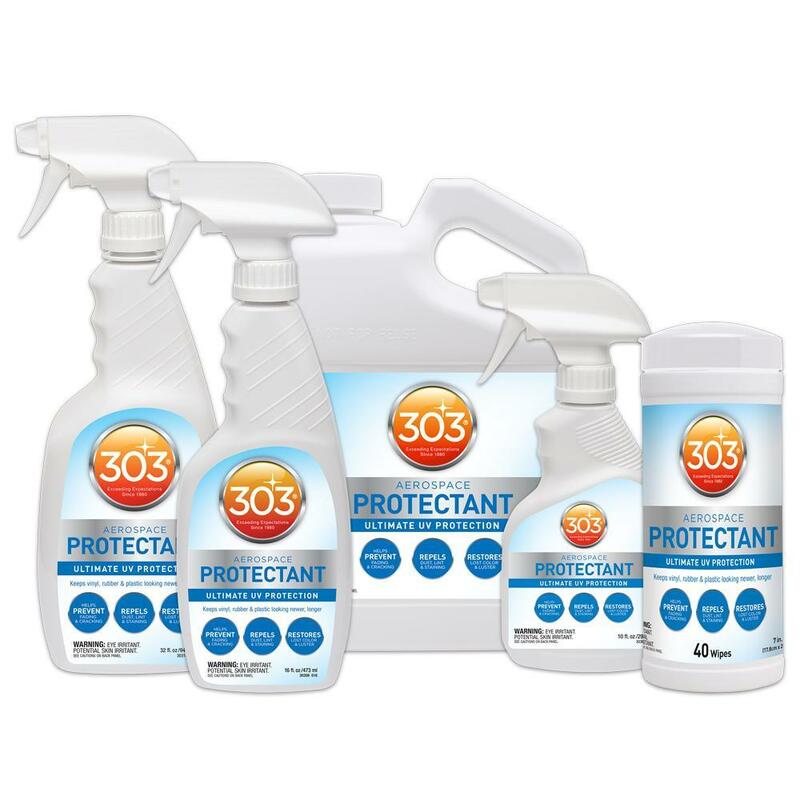 Keeping your interior looking clean and dust free can be challenging, but the 303 Protectant is up to the challenge. Applying the 303 Protectant to your dashboard, arm rests, seats and doors will help repel dust, dirt and human oils from collecting. Many other dressings are oily and greasy which can actually attract dust and dry out the surface. Any surface you apply Aerospace Protectant to will leave behind a beautiful matte finish. 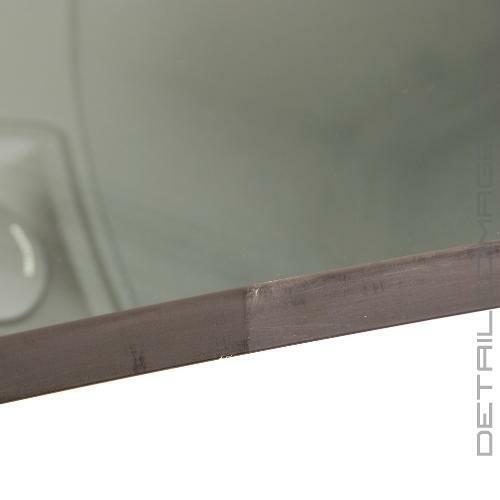 For best results just apply one nice thin coating and you'll instantly notice the beautiful finish it leaves behind! 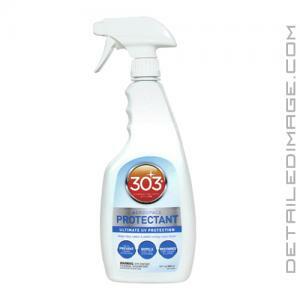 303 Aerospace Protectant is a great product in every sense of the word and one that I don't see myself replacing with anything for many years to come. It passes with flying colors all the tests detailers like myself look for in such products...ease of use, quality/performance and durability. It can protect anything from tires, to exterior trim, to interior leather, and so on. It's just as easy to use on one as it is on another part of the vehicle and does a great job no matter what it protects. Also, it never leaves a glossy/oily surface that detracts from the cleanliness of the car or car part. The finish is matte and clean looking. Developed for aerospace and aviation applications, 303 AEROSPACE PROTECTANT is the World's most effective UV screening product. Restores & maintains a like-new appearance, texture and color. Repels dust, soiling & staining. Spray on and WIPE COMPLETELY DRY. Apply every 3-5 weeks for maximum UV protection. Interior/Exterior: Vinyl & leather interior, plastic bumpers, fender flares, trim and lenses, car bras, tonneau covers, vinyl soft tops & plastic windows, chrome and alloy wheels. Spray on and WIPE COMPLETELY DRY. Synthetic & Natural Rubber: For inflatable boats, wet/dry suits, tires, door & trunk seals and under-the-hood rubber. Spray on, wait 5 min, and WIPE COMPLETELY DRY. RV EPDM Rubber Roofing: Clean surface. Spray or mop on 3 x 3 foot area. WIPE COMPLETELY DRY. For your safety, never walk on a wet roof. Fiberglass: RV's, boats, truck caps. Out of direct sun, spray surface with 303 and wipe completely dry. If streaking occurs, too much product has been used. Use a wet towel to remove excess, IMMEDIATELY WIPE COMPLETELY DRY. Motorcycles/ATV's/Snowmobiles, PWC's. : Spray on, wipe dry & polish to a high gloss. Also for gear.... helmets, visors, goggles. Repels dirt, insects, snow ice and road grime. Household: Patio furniture, spa and pool covers, vinyl liners & pool inflatables. For vinyl & leather furniture, jackets, handbags, golf bags. Not for unfinished leathers (such as suede), fabrics (canvas) or floors. Yes. Good thing Detailed image sends the little samples or else i would have never known about this product. It is sort of like Sonax plastic care but i think better, leaving a professional clean and Rich finish with deepened color depth on darker finishes that is not glossy or greasy. It is quite nice from a professional stand point. This is the first time I've tried this product and it's superior to others I've used. I highly recommend to give a try and I guarantee you'll be pleased with the results. Very easy to apply and like others, leaves a clean appearance. This leaves a beautiful matte finish, not over glossy, but just right, all this while screening uv rays. This is now my go to new standard for my dash, door panels, etc... Now if they could make it in different scents that would be awesome. You have earned a lifelong customer. I am very appreciative of your customer service.